Today I’m giving away a book I was given at STORY – the conference I was at last week. When I walked into a workshop there taught by Michael Hyatt, CEO for Thomas Nelson Publishing, there was a hardcover book on each chair. I love receiving books, even if it’s a book I already own, because then I can give it away! I read this book about a month ago – and then thought that I hope many people read this book, so I’m happy to have a copy to give to one of you. It’s a great book – it has statistics and numbers about poverty in our world, but it’s not all about that – it has stories of real people dealing with poverty. It’s not guilt-producing for the sake of making one feel guilty – but it does help the reader take a second look at life, money and stuff. It also includes the personal journey of the author, Richard Stearns, from being a CEO of multiple companies to president of World Vision. This book is endorsed by many people who care about the world’s poor, like U2’s Bono. No matter where you stand as far as religion goes – this is a good book to read. I’ve always believed in helping others – it’s what makes the world go around – but after reading this book I’m revisiting some of my thoughts on the poor and my responsibility to them. In an ideal world, I think God, the creator of all, should be taking care of anyone that is starving, but obviously he has left it in our hands – we are his hands/feet to help each other. What can you or I do to help relieve someone’s poverty and suffering? 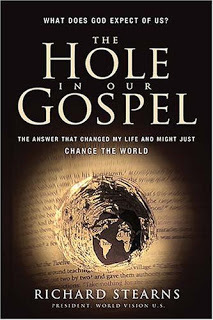 Do you think your worldview and/or your understanding of the gospel of Jesus has a hole in it? Leave a comment and/or your name to be entered in the drawing for this book. Wow. That quote alone makes me want to read the book. Powerful. Thanks for sharing it. Ok, I either win this one or go buy it myself!!! Thanks for sharing Janet…you're the best!!! Hi Janet, It was great to have you visit and drop encouraging words at Faith Barista yesterday! Thanks for sharing such a poignant message in this post. Janet … this is not a book I would normally read or buy … but your note called to me so I just ordered it on amazon. By giving away one copy, you may be putting it into the hands of many! What a great idea. Thanks. Oh, boy. That quote undid me. It's one of those that has staying power. Why, indeed. Just discovered you blog through Billy's blog. Lucky me that it so happens there is a book giveaway. Would like to read this book. My focus is on working with the vulnerable so this would be an interesting read indeed. Whoever gets it, thanks for letting me know about this book. Blessings to you.